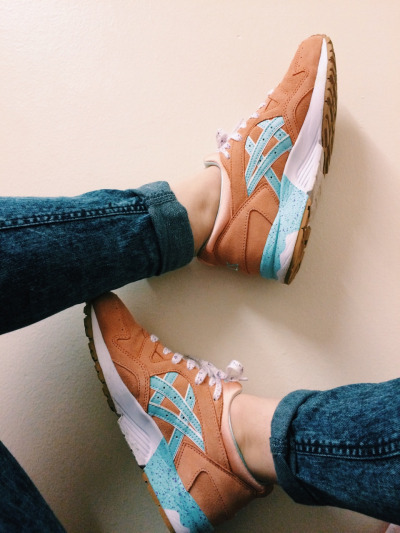 The first are my Gel Lyte V's in "coral reef/clear water". This colourway is pretty outlandish for me (the girl who lives in black) but I think it's a really nice combination for summer. This style features a coral suede upper with teal accents and purple speckles, which are also found in the white laces. The gel cushioned midsole makes it feel like you're floating. 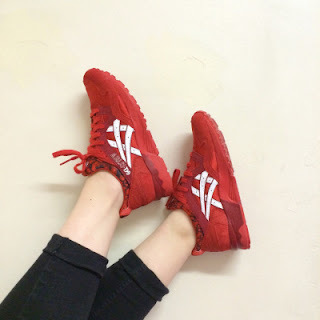 This is my first pair of Asics and now I'm fairly obsessed. My second pair were a present from my boyfriend; these are the Gel Lyte V's from the 2015 Valentine's pack. They are the same shape and comfort as the coral ones but these are even MORE garish and obnoxious. I love them! These have some pretty sweet details, including the floral patterned sock lining and "be mine" scripted on the insole. The back heel panel even has a pretty cool crinkled texture (which I read somewhere was meant to resemble tissue paper that you'd wrap a Valentine's gift in. Not sure how true that is, but thought it was a cute detail anyway.) This pair also came with some white rope laces which I'm yet to try, but I think the contrast would look good.